Description: Application used for scanning and archiving documents - stored in subject-based folders or binders which correspond to traditional archives. E-archive is far more secure, less effected by the consequences of chance events and finding documents is much easier. Description: Customizable free-form cardfile type database - manage contacts, references, notes, recipes. There are no predefined fields, which means you can use this program as a database for just about anything. Options include searching, printing, merging, networking, encrypting, web browsing, phone dialing and more. Modern replacement to Microsoft Cardfile.exe, for all 32-bit Windows. Simple, powerful and inexpensive. Free unlimited trial. Description: This is the Number 1 free software for Bird Watching and Bird Watchers worldwide. This is the most user friendly program of it's type. You only have to enter info in the data fields that you choose. This program let's you easily keep detailed information about each of your bird sightings, such as: DATE OF SIGHTING, TIME OF SIGHTING, NAME OF BIRD SIGHTED, HOW MANY BIRDS SIGHTED, SIGHTING LOCATION DESCRIPTION, SIGHTING ADDRESS, and more. 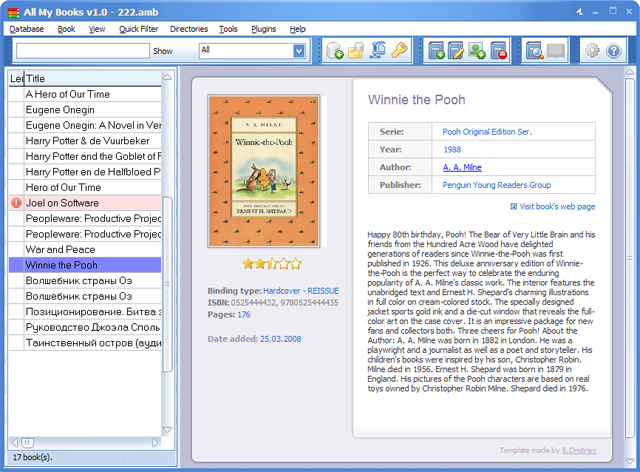 Description: BookCAT is a fully featured book organizer database which will help you catalog a book collection of any size. Book lovers, churches, schools, clubs and business libraries all over the world are discovering that it is not necessary to spend thousands of dollars to get a sophisticated inventory manager that will keep track of a large (or small) book collection. Description: Database stores data relevant to extensive catelog item collections. Includes searchable fields. Supports importing and exporting. Prints entire database or selected records. Option to find books online. Perfect for book collectors, librarians, and more. Description: As a successful man, you certainly communicate with a large number of women. As a result you need to remember a lot of things, including dates of birthday, hobbies, favorite books, favorite music and of course her sexual preferences. The more you know about her the more she appreciates you. The more you forget - the less your chances are. You can use CasanovaDB to store information about your women and you won't forget anything! Description: CATraxx is a powerful music organizer database which will help you catalog a music collection of any kind, from vinyl records to CDs to MP3s. Automatically download CD data from the Internet, or scan your hard drive for audio files. A comprehensive set a data fields enables you to keep track of a wide range of information. With CATraxx, you are in control of your music collection.